Cartola and Carlos Cachaça with Nelson Cavaquinho. — Carlos Cachaça commenting on this samba’s loss in Mangueira’s 1961 samba selection process. This samba by Cartola and Carlos Cachaça traces a nostalgic history of the genre, contemplating the more commercial direction it had taken by the beginning of the 1960s. The pair composed the samba for Carnaval 1961, at the urging of some of Mangueira’s head honchos, who wanted Cartola more involved with the school he’d helped to found decades earlier. But the song lost in the school’s Carnaval samba selection to an easily forgotten samba with a faster beat. Disheartened, Cartola swore off composing sambas-de-enredo for good. Cartola and his wife Zica in February 1975. Displeased with the direction samba had taken by the early 1960s, the couple opened their short-lived but famous restaurant Zicartola, which was largely responsible for bringing renewed success to samba de morro in the 1960s. At the time, Cartola was renewing his ties with Mangueira after having all but vanished from the morro and Rio de Janeiro’s samba scene in the late 1940s and early ’50s. A succession of misfortunes had led him away from Mangueira: In 1946, at 38, he had a life-threatening case of meningitis, which left him incapacitated for about a year (and inspired his samba “Deus, grande deus“); shortly after, he lost his wife Deolinda. He moved away from Mangueira to Caju with a stormy new love interest, Donária, leaving even his guitar behind. He only made his way back to his old neighborhood when he began his best-known romance, with Zica, whom he’d grown up with in Mangueira — and who was Carlos Cachaça’s wife’s sister. Meanwhile, in the decades that followed Mangueira’s founding in 1928, samba had grown increasingly popular as a national genre, in step with the quick expansion of the radio industry in Brazil. Through the voices of radio stars like Francisco Alves and Mario Reis, sambas composed in Rio’s poorest morros became popular among middle-class listeners in Rio’s upscale Zona Sul and across Brazil (see “Divina dama” and “Perdão meu bem,” both Cartola, below). Almost all financial returns, unsurprisingly, went to these radio crooners and industry insiders who made dubious deals to purchase the sambas; the composers continued to live in deep poverty as their songs rippled over radio waves across the vast country. One of several odd jobs Cartola kept to earn a meager living was as a painter, which is why he wore the famous hat responsible for his nickname. Middle class composers like Ary Barroso gained ground in the 1930s and 1940s, popularizing a brand of samba that didn’t sit so well with sambistas like Cartola. Noel Rosa was also a crucial figure in bringing elements of samba from the morros to Rio’s more upscale neighborhoods. And with the increasing popularity of the genre among well-heeled Brazilians, more middle-class composers like Ary Barroso, João de Barro, Lamartine Babo, Dorival Caymmi and Assis Valente emerged into the samba spotlight, and artists like Carmen Miranda popularized their sambas abroad. This further reduced the space for composers from Rio’s samba seedbeds. Marginalized in this regard in the ascension of the genre they’d helped create, sambistas do morro also quickly lost any say in the same samba schools they had founded. When the municipal government of Rio de Janeiro included the samba schools’ Carnaval parades on its official calendar in 1935, it set in motion a process that gradually took the spirited communal parade in a dramatically direction from its origins in Praça Onze. In the 1940s, 50s, and 60s, the desfile became increasingly commercial, with a greater focus on promoting the artists of each schools’ floats and ultimately the schools’ financiers, rather than local samba composers. What’s more, in the early ’40s, Praça Onze — where the first samba school displays took place in the late 1920s and early ’30s, and where malandro sambistas would hold dance-offs on the scale Cartola mentions in this song, a weigh station for animal-traction vehicles — was destroyed to make way for an expansion of Avenida Presidente Vargas, inaugurated in 1944. The “school at Praça Onze” that Cartola mentions in the song is GRES Estácio de Sá, which started out as Deixa Falar. It’s widely recognized as Rio’s pioneer samba school, whose sambistas modified the genre in the late 1920s to make it easier to samba and parade to – “samba de sambar do Estácio.” Ismael Silva, one of the most prominent samba composers from the school, also took credit for for the name “samba school” itself, recalling that when they founded Deixa Falar, there was a school nearby, and he said, “We’ll be the professors of samba!” While Portela was out the Central train line in distant Oswaldo Cruz, Mangueira and Deixa Falar were friendly neighbors near the praça: “We would parade on Sundays of Carnaval at Praça Onze and, on Mondays, the sambistas from Estácio would come up the morro do Mangueira; on Tuesdays, Mangueira would go down to Estácio. It was a great friendship,” Cartola recalled. 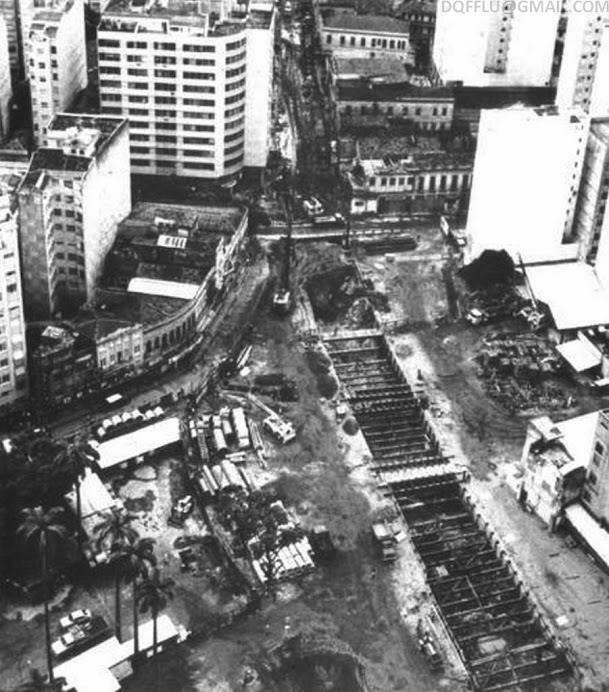 The destruction of Praça Onze was symbolic of the fate of composers like Cartola during those years. Largely brushed aside by the music industry, they also saw their Carnaval coopted, with wealthy big-wigs running the show that had begun with ragtag Carnaval corps parading on their own. More and more attention was focused on middle-class Brazilians and tourists, and to appeal to this wider, wealthier audience, schools favored faster, noisier songs (in contrast to more traditional sambas like “Tempos idos”) – the precursors of the incredibly uptempo sambas-de-enredo of the schools today. Era um terreno baldio / Que eu mesmo capinei / Com um surdo mal feito de lata / Uma escola de samba fundei / Usei corda na avenida / No desfile principal / Esquentava a bateria / Com pedaço de jornal / A minha escola cresceu / E o terreiro hoje tem cobertura / Quem ficou pequenino fui eu / Diante da nova estrutura / Eu quem fundou a escola / Entre trancos e barrancos / Na galeria de sócios / No lugar do meu nome tem um branco / E vou contar a minha mágoa, minha minha dor / Fui barrado na porta da escola que sou fundador (It was an unused plot of land/ That I myself cleared/ And with a crude surdo made from a can/ Founded a samba school/I paraded in the avenue/ in the main parade/ I warmed up the battery/ With a piece of newspaper/ My school grew/ And the terreiro today has a roof/ I´m the one who grew smaller/ Before that new structure/ I who found (sic) the school/ by fits and starts/ In the gallery of associates/ There’s a blank space where my name should be/ And I´ll tell you my wound, my pain / I was barred at the door of the samba school that I founded). As “Tempos idos” makes reference to, Portela was Carnaval champion in 1959, and representatives of the school were indeed invited to Itamaraty, Brazil’s foreign ministry, to perform samba for the Duchess of Kent. Cartola and Carlos Cachaça adopted an almost admiring tone in parts of this song, as if they were slightly proud of samba’s success, but much more deeply saddened by the route and costs of that success. This was the context in which Cartola made a final attempt, with Carlos Cachaça, at composing a samba-de-enredo for his school. Shortly after, Cartola opened the restaurant Zicartola together with Zica. Though it only functioned from 1963 to 1965, it immediately became a bastion for sambistas of Cartola’s stock, and inspired cultural gatherings and groups like “A Voz do Morro” which were in part responsible for a ressurgence in popularity of samba do morro. Praça Onze and its terreiros – as this post mentions – served as the birthplace of carioca samba. The homes in neighborhoods surrounding the praça comprised a large community Afro-Brazilians who had come from Bahia after the end of slavery in 1888, along with Jewish immigrants from Eastern Europe. Heitor dos Prazeres famously said, “Praça Onze was a miniature of Africa,” which led many to refer to the region as Rio’s “Little Africa.” The denomination of Little Africa came to refer to the area from Praça Onze (Cidade Nova) to modern-day Praça Mauá. Terreiro refers to the large patio-like spaces – usually with earthen floors – in these homes where composers would spend sometimes days on end rehearsing their latest sambas and experimenting with new compositions. Terreiro also refers to the similarly characterized space for Afro-Brazilian religious rituals. In the beginning, samba and macumba were almost inextricably linked. One of Carlos Cachaça’s sambas from the late 1920s went, “Eu fui a um samba na casa de Tia Fé/ de samba virou macumba/de macumba candomblé” (I went to a samba at Tia Fé’s/from samba it turned into macumba/ from macumba, candomblé). Originally, samba schools had Orixás that were considered their protectors, which their particular beats paid salute to: Mangueira was Oxóssi, for example, and Salgueiro, Xangô. Tellingly, as samba and carnaval became more of a lucrative industry, the terreiros took on a more middle-class, secular denomination: “quadras,” or courts. The scale the song refers to was one of ten installed in the city in response to a 1901 decree that aimed to control overweight animal-drawn carriages. The scale in Praça Onze became better known for serving as a stage for samba competitions, and its name might have provided some symbolic meaning as well, as it was used to “weigh” who was better in their batucada and swing. Main sources for this post: Cartola: os tempos idos by Marilia T. Barboza; Zicartola, by Mauricio Barros de Castro; Dicionário da História Social do Samba by Nei Lopes and Luiz Antonio Simas; and Uma história de música popular brasileira, by Jairo Severiano. Ameno Resedá picnic in Paquetá, 1911. Image via “Ameno Resedá: o rancho que foi escola” by Jota Efegê. 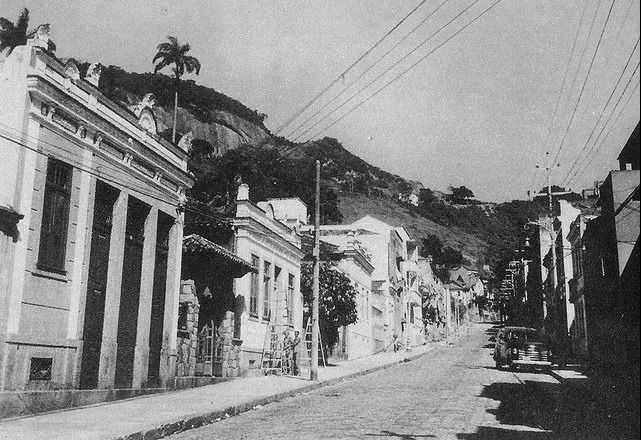 Rua Santo Amaro in 1956. The road links the Rio neighborhoods of Glória and Santa Teresa. This photo is around No. 124 on street. Pastoras of Ameno Resedá, Carnaval 1911, the year Ameno Resedá paraded for Brazil’s president at the Palácio de Guanabára with the enredo Court of Belzebuth. In this song, Aldir Blanc retraces the history of Ameno Resedá, which was indeed founded during a picnic on Paquetá – a bucolic island borough of Rio de Janeiro – on February 17, 1907, with headquarters on Rua do Catete, and which paraded in Carnaval from 1908 til 1941. Blanc tells the story of the rancho through the story of a romance, blurring a love story with the story of his love for Ameno Resedá itself. 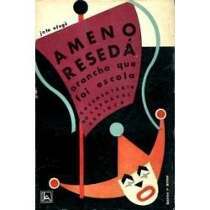 Cover of Jota Efegê’s 1965 book “Ameno Resedá: o rancho que foi escola”. Flor de Abacate (avocado flower) and Papoula de Japão (Japanese poppy) were other important ranchos that followed Ameno Resedá’s model, along with União da Aliança, which is mentioned toward the end of the song. (*The line that follows União da Aliança – “caprichosa, em estrelas desenganos” – might be referring to that rancho or other ranchos; several ranchos had “estrelas” in their name.) 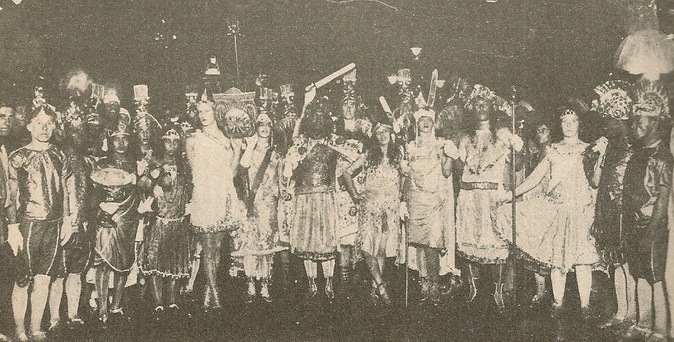 The Queen of Sheba was the theme of Flor de Abacate’s carnaval parade – its enredo – in Carnaval 1924. View from Pedra da Moreninha, Paquetá. 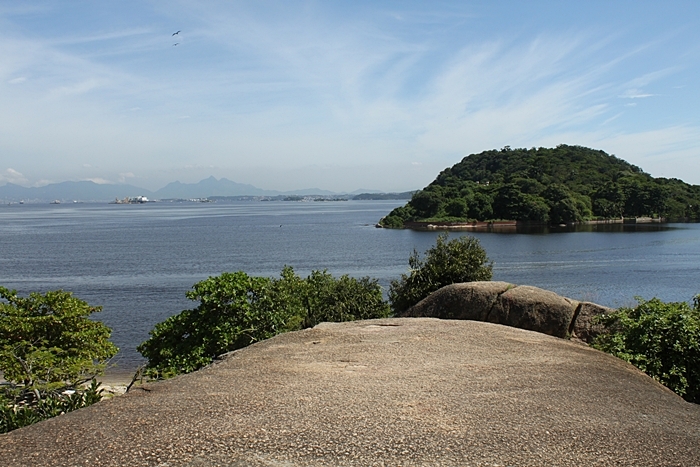 Pedra da Moreninha is a rock and look-out point on Paquetá that takes its name from Joaquim Manuel de Macedo’s classic 1844 novel A Moreninha; in the story, the moreninha gazes from a high rock in Paquetá out over the sea, anxiously awaiting the return of her beau, Augusto. As founders of Ameno Resedá recalled, the picnic where the rancho was founded took place under a mango tree right near Pedra da Moreninha. Joaquim Callado (1848-1880) was a flautist and composer who formed what’s believed to have been Rio de Janeiro’s first choro group, Choro do Callado, in 1870, made up of two guitars, a cavaquinho, and Callado’s flute. The phrase “choro do Callado” could be referring to the group but more likely refers to any choro he composed. 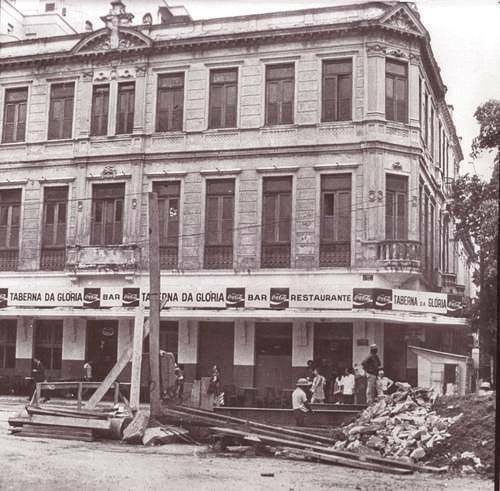 Taberna da Glória in 1972. Taberna da Glória still exists today, across Rua do Catete from the beginning of Rua Santo Amaro. Photo via Rio de Janeiro Memoria&Fotos (Facebook). Gilberto d’Avila played pandeiro with Jacob do Bandolim – the Gilberto and Jacob that the song makes reference to. Many homes and buildings were destroyed during the construction of the metro in the 1970s. I’ve included photos below of Rua do Catete in 1906 and Rua do Catete during metro construction, around 1977. 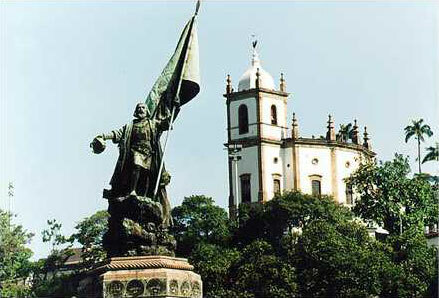 “Outeiro” literally means small hill, but here is referring to the cathedral of Our Lady of Glory of Outeiro da Glória, which sits atop a small hill overlooking the neighborhood, and gave the neighborhood its name. Ranchos emerged first in northeastern Brazil, particularly Bahia, inspired in Portuguese Christmas celebrations that culminated on January 6: Three Kings Day of the Catholic church, and in Candomblé, Festival de Oxalá, the day to worship Oxalá, the Candomblé deity syncretized with Jesus. In groups known as ranchos — which can mean something like religious procession — singers called pastores and pastoras (shepherds) danced door-to-door in flashy clothes with small orchestras, asking for money. They always set out dancing toward a Nativity scene, the object of their worship. Ranchos maintained this largely Afro-Brazilian religious aspect until the founding of Ameno Resedá in 1907. The Pernambucan Hilário Jovino Ferreira was a pivotal figure in popularizing ranchos for Carnaval in Rio. A son of freed slaves, Hilário made his name as a Carnival booster and rabble-rouser in Bahia. He moved from Salvador, Bahia, to the Saúde neighborhood of Rio de Janeiro in 1872, and quickly became well-known, a regular at the homes of Carnaval fixtures like Tia Ciata, alongside such illustrious figures as Donga, Pixinguinha, and João da Baiana. Rancho Caprichosos de Estopa, with the porta-estandarte Celia Afonso (vaguely) visible in the middle. When Hilário moved to Rio he joined the already existing rancho Dois de Ouros, on Morró da Conceição. But he ended up arguing with the rancho’s organizers, and on January 6, 1894, founded the rancho Rei dos Ouros. Rei dos Ouros set itself apart by parading during Carnaval, rather than January 6, and introducing greater female participation and the use of a porta-estandarte — a woman parading with the rancho’s standard, a tradition that was passed on to samba schools. 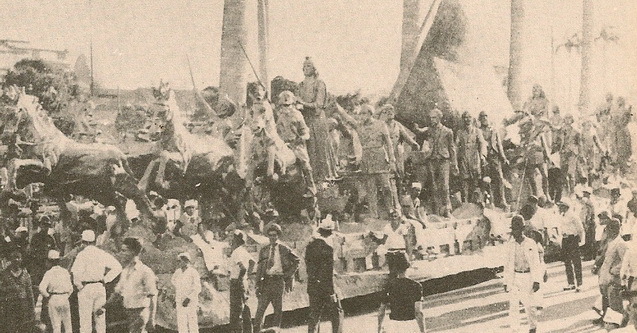 Main float, Clube dos Fenianos, Carnaval 1934. Ranchos offered a more elaborate form of revelry for groups that had previously paraded in more tumultuous and clamorous street groups known as cordões, and quickly became the most popular form of Carnaval celebration among Rio’s less privileged classes. They were known as pequenas sociedades (small societies), sharing the Carnaval stage on Avenida Rio Branco in the 1920s and 1930s with the more well-to-do classes’ grandes sociedades: clubs of the white middle class and aristocracy that had emerged in the late 1860s and held European-style processions with floats. The most important of the grandes sociedades were Tenentes do Diabo; os Democráticos (still a popular club in Rio today, and the official “padrinho” [patron] of Ameno Resedá); and os Fenianos. Both pequenos and grandes sociedades lasted until the early 1940s, when samba schools overshadowed them for good. The serene lyricism of ranchos’ music — particularly that of Ameno Resedá and ranchos that followed the rancho-escola’s lead, like Flor de Abacate and Lira de Ouro — led to the development of the marcha-rancho, the most poetic of Carnaval musical genres. Marcha-ranchos are nostalgic and sentimental, with a slower tempo than the marchinhas that were also gaining popularity at the time. Some examples include “Pastorinhas” (João de Barro & Noel Rosa); “Os rouxinóis” (Lamartine Babo); “Rancho da Praça Onze” (João Roberto Kelly & Francisco Anísio); and “Bandeira branca” (Max Nunes & Laércio Alves). 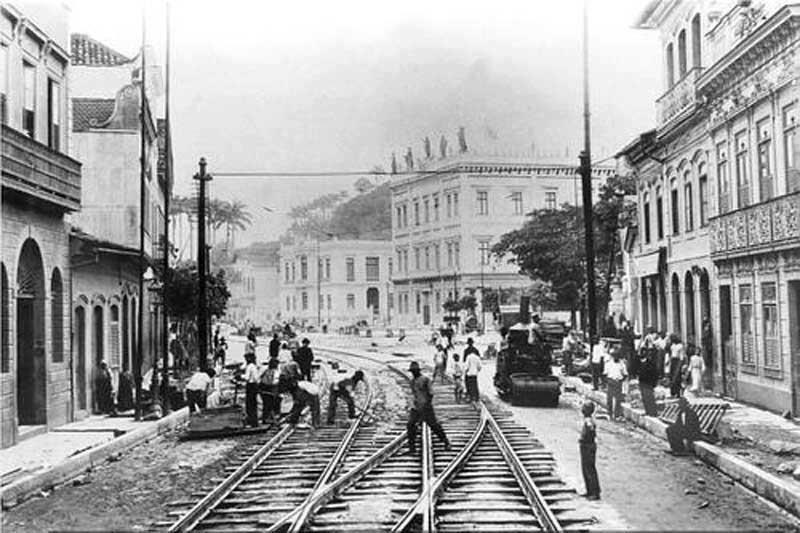 Trolley tracks being laid on Rua do Catete in 1906. In the photo we see Palácio do Catete and next to it, Escola Rodrigues Alves, which was demolished during metro construction. Photo: Augusto Malta. Metro construction on R. do Catete, 1977. Photo via Rio de Janeiro Memoria&Fotos (Facebook). Main sources for this post: Ameno Resedá: o rancho que foi escola by Jota Efegê; Escolas de Samba do Rio de Janeiro by Sérgio Cabral (2011); Uma história da música popular brasileira, by Jairo Severiano (2008); 100 anos de Carnaval no Rio de Janeiro, by Haroldo Costa; website of Universidade Federal Fluminense.